Director – Mick Garris, Teleplay – Matt Venne, Based on the Novel by Stephen King, Producer – Michael Mahoney, Photography – Barry Donlevy, Music – Nicholas Pike, Visual Effects Supervisor – Ken Locsmandi, Production Design – Guy Lalande. Production Company – Headline Pictures/Nice Guy Productions/Sennet Entertainment. Top-selling author Mike Noonan is at a bookstore signing when his wife Jo is hit by a bus and killed as she crosses the street outside. Mike is shattered in the aftermath and falls into a slump, finding he is no longer able to write. He comes to believe that Jo is communicating with him from beyond the grave. He is drawn up to the cabin he inherited at Dark Score Lake. There Jo’s presence increases, appearing to point towards various clues. Mike intervenes to save a young girl Kyra, the daughter of widowed Mattie Devore, from being run down on the road. This propels Mike into the midst of a custody battle for Kyra being fought by Mattie and her late husband’s aging father, the wealthy Max Devore. Mike is summonsed to a legal hearing intended to disprove Mattie’s competence but comes out on her side. This earns the enmity of Max Devore who is obsessed with obtaining custody of Kyra. At the same time, Mike realises that Jo’s spirit is guiding him to investigate the mysterious death of singer Sara Tidwell in 1939 and how this laid a curse on the town that drives the townspeople to drown their daughters in the lake. Sometimes in cinema there are relationships between creative talents that only serve to bring out the worst in either – Edward D. Wood Jr and Bela Lugosi, Joel Schumacher and the Batman comic-book, Uwe Boll and any videogame source. Add to that the names of Mick Garris and Stephen King. Stephen King is perhaps the most successful writer in the world. Mick Garris is a director who has clearly become good friends with Stephen King and has now become the most recurrent adaptor of King’s works to the screen, having so far been responsible for directing the original King screenplay Sleepwalkers (1992) and the adaptations of The Stand (tv mini-series, 1994), The Shining (tv mini-series, 1997), one of the two stories in the anthology Quicksilver Highway (tv movie, 1997), Riding the Bullet (2004), Desperation (tv mini-series, 2006) and Bag of Bones here. I have no problem placing Mick Garris on a list of people I consider the worst directors in the world. He seems to have nothing else in his arsenal other than the pop-up effect – figures lunging into the camera to conduct some variant on going “boo” or to ominously leer while repeating some meaningful phrase. Garris seems to have no concept of subtlety, no concept of creating atmosphere – he seems to believe that these pop-up effects repeated ad nauseum are what it takes to scare an audience without the realisation that all it does is reduce their effect to repetitive tedium. On the side of the dramatics, Garris’s ability to create depth or nuance to his characters is non-existent. He seems to have no concept of being able to allow his actors to portray complex emotions – indeed, Mick Garris’s sole idea of venturing inside the psychology of his characters is to throw in pop-up dream sequences or symbolic flash fantasies. To his credit, Mick Garris has managed to hold it together on a couple of occasions – his adaptations of The Shining and Desperation both emerged okay. After at least indicating that he was heading in the right direction with these, Bag of Bones shows Garris alas heading back to the same territory as painful clunkers like Sleepwalkers and Riding the Bullet. There is the constant profusion of pop-up effects – flash nightmare images of Annabeth Gish being dragged away under the bed, Pierce Brosnan having meaningfully symbolic dreams of opening up coffins to find phones ringing. The first hour of the mini-series plays out as a ghost story where Garris’s effects are predictable and hackneyed – the house ominously rattling, the mildly effective scene of fridge magnet letters seen rearranging themselves to spell things out, imagined bodies popping up out of the water of a bath. Garris borrows the effect from Stanley Kubrick’s The Shining (1980) of having Pierce Brosnan kiss someone and they turn to a corpse – and seems so in love with the effect that he repeats it three times in a row. Some of these effects become unintentionally absurd – Pierce Brosnan under attack from a stack of gramophone records being flung across the room at him, the climactic scenes involving him being battered by the leafy branches of a tree with the shape of a woman’s face in it. The script is a reasonably faithful one that closely adheres to the book on most plot points bar some minor condensing and trimming. Alas, it is the wrong type of story to be given to a director like Mick Garris as too much of it exists in the twilight zone of imagination and supernatural manifestation or imagined scares. This turns far too much of the story over to the things that Mick Garris does badly – ambiguity, psychological subtlety and character-driven drama. Naturally, Garris only delivers these scenes in terms of a constant profusion of pop-up effects a la the horrendous experience that was Riding the Bullet. 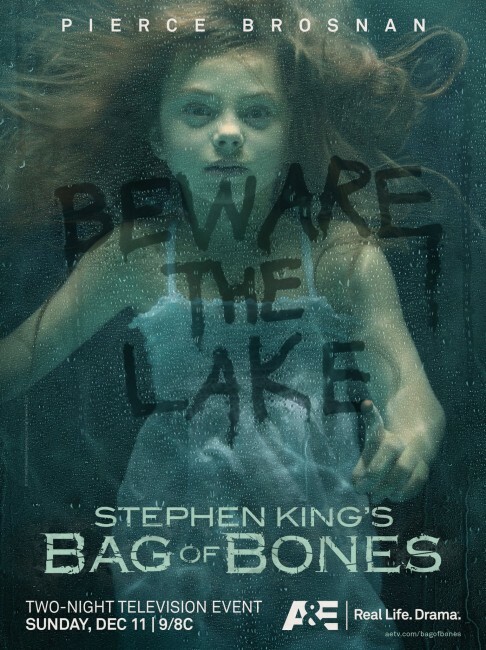 The point it is important to make is that the book of Bag of Bones (1998), when I read it, was intended by Stephen King as a subtle psychological ghost story. The very fact that it has been placed in Mick Garris’s hands seems to wring any subtlety out of it and turn everything into lunging pop-up shocks that only serve to destroy the book’s delicate mood. More importantly, so many of Stephen King’s works are dependent on his individualistic voice as a writer. Without that emerging on screen, all that Bag of Bones becomes is a banal and tepid ghost story that seems little above the level of a 1970s made for tv movie. Worse is Garris’s casting where everyone opposing the hero seems unable to be allowed to demonstrate their malevolence by their performances but has to be physically caricatured as well – William Schallert is placed inside a motorised wheelchair and shown as aging and decrepit; Deborah Grover’s retainer is made up like a mummified member of the Addams Family; the corrupt lawyer who acts as Kyra’s guardian is cast with one of the creepiest actors in the business Julian Richings who seems to be all long, gaunt and bony face and screeches out his dialogue. There is no reason why any of these characters could not have been played by regular actors but the hideous exaggerations seem to be no more than Mick Garris trying to explain their characters physically, which is surely the effect of underlining something in screaming red neon. Pierce Brosnan is an odd choice in the central role of Mike Noonan. Brosnan works perfectly well in a role like James Bond or in The Thomas Crown Affair (1999) – smoothly polished, certain of his handsomeness and ice cold. What Pierce Brosnan never seems to suggest is the role of the average guy, the family man or the ordinary working class hero thrust into something he does not understand. I could never convincingly buy him as a writer here, it just seems like a well-known actor pretending to play a part. This is also a role that should be much more internalised and psychological. The way the early sections of the mini-series ought to have come out should have taken us inside the grief that Brosnan feels, the spiralling descent and teetering on the brink of madness where the sudden appearance of the supernatural sits on an ambiguous edge where you cannot be sure if he is imagining it or not – yet Pierce Brosnan is wrong for it and Mick Garris entirely unattuned to the psychological complexities of the part. 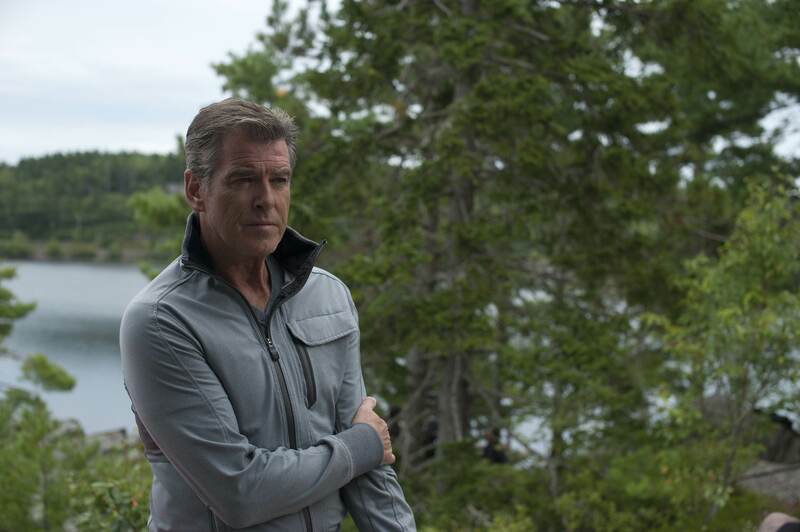 Similarly, Melissa George has never looked lovelier, yet there is no conviction to the relationship between her and Pierce Brosnan – the only thing that seems to bring them together is the turning of the plot, not any emotion. When she is killed, it is undeniably a jolt, but crucially we feel no sense of tragedy at the abrupt despatch of a major character. As with any Mick Garris film, there is also a number of cutsie in-joke Stephen King references, again something that seems pointless. Annabeth Gish leaves Pierce Brosnan with a nerdy fan “I’ll leave you with Annie Wilkes here” [the psycho heroine of Misery (1990)], while Jason Priestley’s agent mentions the release of a new Richard Bachman book, after the well-known pseudonym that King used on several occasions. Mick Garris’s other genre works as director include:– Critters 2 (1988) and the cable tv movie Psycho IV: The Beginning (1990); the tv movie anthology Quicksilver Highway (1997), which adapted stories by Stephen King and Clive Barker; the virtual reality tv movie Virtual Obsession (1998); versions of Stephen King’s Sleepwalkers (1992), The Stand (1994), The Shining (1997), Riding the Bullet (2004) and Desperation (2006). Garris also came up with the stories for Batteries Not Included (1987), The Fly II (1989) and Hocus Pocus (1993), worked as story editor on the Steven Spielberg produced anthology tv series Amazing Stories (1985-7), and has produced the anthology series Masters of Horror (2005-7), Masters of Science-Fiction (2007) and Fear Itself (2008-9). Other Stephen King genre adaptations include:- Carrie (1976), Salem’s Lot (1979), The Shining (1980), Christine (1983), Cujo (1983), The Dead Zone (1983), Children of the Corn (1984), Firestarter (1984), Cat’s Eye (1985), Silver Bullet (1985), The Running Man (1987), Pet Sematary (1989), Graveyard Shift (1990), It (tv mini-series, 1990), Misery (1990), a segment of Tales from the Darkside: The Movie (1990), Sometimes They Come Back (1991), The Lawnmower Man (1992), The Dark Half (1993), Needful Things (1993), The Tommyknockers (tv mini-series, 1993), The Stand (tv mini-series, 1994), The Langoliers (tv mini-series, 1995), The Mangler (1995), Thinner (1996), The Night Flier (1997), Quicksilver Highway (1997), The Shining (tv mini-series, 1997), Trucks (1997), Apt Pupil (1998), The Green Mile (1999), The Dead Zone (tv series, 2001-2), Hearts in Atlantis (2001), Carrie (tv mini-series, 2002), Dreamcatcher (2003), Riding the Bullet (2004), ‘Salem’s Lot (tv mini-series, 2004), Secret Window (2004), Desperation (tv mini-series, 2006), Nightmares & Dreamscapes: From the Stories of Stephen King (tv mini-series, 2006), 1408 (2007), The Mist (2007), Children of the Corn (2009), Everything’s Eventual (2009), the tv series Haven (2010-5), Carrie (2013), Under the Dome (tv series, 2013-5), Big Driver (2014), A Good Marriage (2014), Mercy (2014), Cell (2016), 11.22.63 (tv mini-series, 2016), The Dark Tower (2017), Gerald’s Game (2017), It (2017), The Mist (tv series, 2017), Mr. Mercedes (tv series, 2017– ), 1922 (2017), Castle Rock (tv series, 2018– ) and Pet Sematary (2019). Stephen King had also written a number of original screen works with Creepshow (1982), Golden Years (tv mini-series, 1991), Sleepwalkers (1992), Storm of the Century (tv mini-series, 1999), Rose Red (tv mini-series, 2002) and the tv series Kingdom Hospital (2004), as well as adapted his own works with the screenplays for Cat’s Eye, Silver Bullet, Pet Sematary, The Stand, The Shining, Desperation, Children of the Corn 2009, A Good Marriage and Cell. King also directed one film with Maximum Overdrive (1986).